You will never regret this purchase as long as you live. The Best boot ever made. Like gloves made for your feet. Stomp anything imaginable with the most comfort and safety available on the planet. Made in USA. Hoorah! If they ever wear out, will get another pair. You will fall in love with them and become old friends. I love my new boots. Fit and finish is superb. Delivery was fast and painless. Excellent boots, Excellent service. My Project Manager is very pleased and proud to be wearing a boot of this quality. And its time to order another pair. Michael S Splawn, Drill Sergeant's Development Company. Second pair of Corcoran's, first pair of steel toe. Im very happy with the boots they are perfect. I love these boots...I've just bought my 2nd Pair, and that's only because I do so much walking and I have some foot supination that killed my soles. That said, the leather on my first pair is almost as good as new after a year and half, so I'm just having them resoled to keep this new pair extra shiny. Corcoran makes great boots, customer for life! Definitely fit bigger in the length. Ensure your order one half smaller than your current size. The boot is well made and of good quality leather. Plenty of room in the toe area and width of foot. The only request I have of Shoeline is that they made a straight size 10 EE boot as I was nervous buying a boot 1/2 size smaller than what I normally wear. Great fit though with the 9 1/2 size. 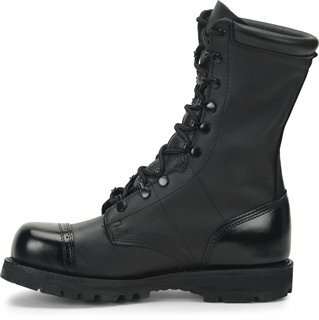 After forty-two years in my 1969 82nd Airborne Corcoran Paratrooper jump boots it was time to get some new ones. Found the new ones to be very comfortable much more so than my old ones although a bit heavier. Love the new virbram soles and the construction seems of high quality. Sorry to say that I found them to be a 1/2 size to large even though I ordered the correct size so I had to return them for a size that fits. Shipping was very prompt and I am looking forward to getting the new ones that will fit. The new ones will be used for Veterans Honor Guard Parade and review and other related veterans functions. I bought size 8 1/2 D and they fit me like my 9 timberlands. I followed someones advice about buying a half size smaller. So if you normally wear a 9 that isnt tight then you will be fine with an 8 1/2. An 8 might fit me even better but may not leave me room to add thicker socks and a odor eater. They definitely are comfy and warm. As soon as they camei went out and walked the dogs in the snow and ice and felt good. The sizing is oddas far as length. It seems to fit almost a 1/4 bigger than regular boots. I usually wear a size 10 for boots and after reading these reviews I ordered a size 9.5 which is a hair too small. The boots do stretch a bit even after a week so it isn’’t too bad. I would recommend that you should order your regular size. As far as quality I haven’’t seen a loose stitch on them anywhere and they are comfortable. Very good quality leather too. Ever since Dr.Martens sold out to China I figured it was about time that I found myself an american made leather steel toed boot. Lo and behold I found this one. I was a bit nervous reading the comments. High rating but with concerns. I understand why. After patiently waiting to get my boots two days I didnt think I was going to make it as I was a dying to rip off my chinese docs and throw them in the bon fire These boots are beautiful I had them laced up and mirror shined within 15 minutes. The width is dead on but there is a good amount of play almost a half inch I would guess Like the other guy wish I could of tried them on but regardless an extra pair of socks and these boots are great. When I first got these they seemed a little large. I ordered the 9.5 EE. There is quite a bit of room in the toe and the boot seems to be more "roomy" than I expected. They feel a bit tight around the calf for someone who has to blouse their pants. We’’ll see what they’’re like after they really break in. I shined these to a mirror so anyone looking to spit-shine has found a great boot. Overall I do like these boots I wish I could have tried them on first to get the proper size. Buying these boots at first is like Christmas. Shiny rugged and they break-in in a short period. I spit shined them and everything. The true test is what they can handle. I use them in a mechanics environment. always getting bumped oil and 99 of the time standing. the boots did their job for the last 3 months including climbing up a mountain. I only have 2 complaints about them. The insole is glued well to the boot making it scary not to rip out part of the boot in the process. The other comlaint is that the upper layer of sole fissures from the second layer in 2 months time. Great boot. comfortable. I had to use another set of laces so it would be easier to slide the laces for faster donning.